The Baird Institute is excited to announce the funding of and collaboration with Vantari VR in building a Virtual Reality (VR) tool for surgical planning. The focus is on improving efficiency and outcomes for patients and is the first of its kind globally to be built for use in Aortic surgery. Professor Paul Bannon, Chair of The Baird Institute, has been instrumental in driving this collaboration, as the potential of this technology is game-changing to the surgical landscape. 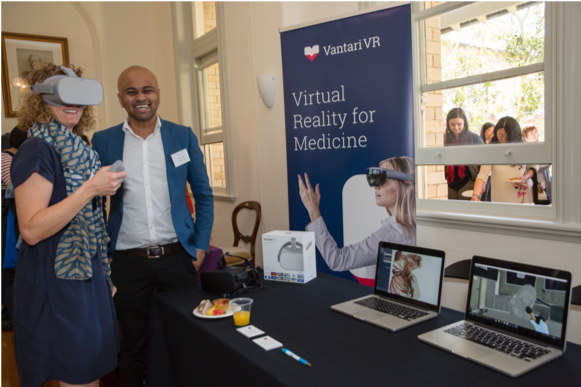 Founded by two young doctors, Dr Vijay Paul and Dr Nishanth Krishnananthan, Vantari VR is considered to be one of the leading Australian start-up medical technology companies, having recently completed the HCF Catalyst accelerator program and received funding from the NSW government. Virtual Reality has made headlines around the world over the last few years and is being used increasingly in healthcare. Clinical trials are already showing that VR can reduce surgical planning time by up to 40% and increase surgical accuracy by 10%. With global powerhouses, such as the Mayo Clinic and Stanford Health Care in the US and The Royal London Hospital in the UK, implementing VR into their research and treatment delivery, this is an important step by The Baird Institute on the national and global stage to drive innovation so as to improve patient outcomes.trials.